So All People Quilt runs a yearly UFO challenge designed to get people working on old and unfinished projects. And I’ve got plenty of those. This project was begun as part of the Simply Solids Bee in… 2013 (?) and then again in the Stash Bee in 2014. I can’t remember how many blocks I have, either 30 or 42 and they’ll be pieced together like this, staggered with partial blocks on certain columns. I’ve got all my blocks, but need to piece them into a top, which then needs to be basted, quilted, and bound. A baby quilt (or very large mini quilt?) using the Moda Love Charm Quilt pattern. It looks brown in this photo, but it’s actually a burgundy/maroon sort of background. I wanted to put a border on this – it’s only 32″ square – but wasn’t able to track down any of the prints that I thought would work best for a border (namely one of the burgundy/maroon-y ones), so it might just stay a small quilt. Needs to be basted, quilted, and bound. This was my first project ever and has been a UFO for over 10 years. The top is pieced (the blocks by hand, even! ), just needs to be basted, quilted, and bound. My second oldest UFO, this was in progress when I moved to Calgary almost 10 years ago. I might be wrong, but I think it’s basted and just waiting to be quilted. For all I know, the pins are rusted into place. I think I won’t like this one much when I fish it out from the closet again, but it’d be good to knock such a long-standing project off the list! A truly dreadful photo – I should pull this one out of storage just to get a better shot of it. Needs to be basted, quilted, and bound. This quilt doesn’t look like much in photos because I’ve got so little of it done – 1/6th of the rows – and couldn’t think of a good way to photograph a single column of a quilt. It will be donated to a charity that benefits my younger sister (who is disabled). It’s following a slightly modified Herringbone quilt pattern from Maureen Cracknell’s Craftsy class, Quick Quilt As You Go. I need to finish sewing up the columns of fabric, then piece them into a top, which then gets lightly quilting to hold it and the back together. This one is further along than the picture implies – all the blocks are sewn, they just need to be pieced into rows and then a top and then to be basted and bound. I had big plans for the border on this quilt, so most of the quilt is pieced… just the side border needs to be finished. Maybe the answer will be to scale back the border idea,… but I like that border idea. I guess we’ll see what happens! Once the border is worked out, then it needs to be basted, quilted, and bound. I usually don’t go for holiday specific quilts, but this one is pretty subtle and in slightly unusual colours – rust, teal blue, deep purple. I don’t have a good photo of it, but the top is completed, it just needs to be basted, quilted, and bound. I really don’t like to finish quilts, do I? This is another, yet another, that just needs to be basted, quilted, and bound. This one is getting to be a pretty long standing UFO of mine, and as it’s meant to be a gift, I’d really, really like to get it done! It’s partially quilted, but there’s still a long road to go (because I had the GENIUS idea of quilting it with quarter inch spacing around all the main units.. quarter inch!!). Quilting and binding is all that’s left. I seem not to have a picture of this quilt top, which is about throw sized and has been laying around for several years. I wanted to try to quilt feathers on it, but was terrified of trying. I think I’m finally ready to just give the feathers a go, whether they turn out good or bad. So basting, quilting, and binding is all that’s left. So that is where that is at! Twelve projects desperately in need of finishing! All People Quilt has already revealed their pick for January, so I suppose I can reveal that Number Six – the Quilt as You Go Project is my goal for January! Just as well because it has a due date early in the year, if I’m going to donate it to my charity of choice! I’ll also be participating in One Monthly Goal, hosted by Elm Street Quilts, and so that same project will be my goal for that linky as well! Categories: UFOs and WIPs | Tags: all people quilt, apqresolution, apqresolution2017, Bonnie & Camille, carolyn friedlander, churn dash, confetti go lucky, confetti quilt, craftsy, doctor who, doctor who stitch-along, Elizabeth Hartman, fandom, fandom in stitches, FreeSpirit, happy-go-lucky, heather bailey, Maureen Cracknell, midnight mystery quiltalong, Moda fabrics, Moda Love, omg - one monthly goal, Plume, QAYG, quilt as you go, Robert Kaufman, simply solids bee, solid fabric, stash bee, Tula Pink, UFOs, v & co, Vanessa Christensen, wip list, work-in-progress | Permalink. It’s getting on a while since I updated last. Mostly I just kind of wanted a break and summer is always a good time for that, but also I was kind of tired of basically only posting entries when I’d bought fabric. It’s not that I’ve not been working on things – I have – I just couldn’t seem to work up the energy to write about them. And maybe I’m still feeling that way just a little, because I’m going to write today about the fabric I’ve recently bought. I don’t usually love Halloween (nor any other season) fabrics, but with these I can largely ignore their Halloween-ness. I don’t know the name of the line these prints come from, the selvedges just say they’re created by Echo Park Paper Co. for Andover fabrics. Oh, and they were from 2013. That purple is just gorgeous, though, isn’t it? The colour in this one came out really wrong – it’s a much darker colour than this, more of a bluey-green, something I wouldn’t call a teal, but… well, just not this. I’m not quite sure how the colour leached out of the photo – I photographed all of these in the same conditions and the rest of them came out really close to real life. Anyway, it’s a print from Piecemakers by Kathy Schmitz for Moda Fabrics. I don’t know what this print is – I bought a half metre of it and there’s not a scrap of text on any of the selvedge! But I sure do want to fussy-cut some scissors and old-fashioned shoes out of it. The blue in this print is actually the same colour as the blue in the print above and they were stored on the same shelf, so maybe they’re from the same line, but I’ve never known Moda not to print info on their selvedges. And finally a bit of Daysail from Bonnie & Camille for Moda. This one doesn’t exactly fit in with the colours of the previous bits of fabric. But I was after text, not matching colours. I decided also to head to another store, one I’d never been to before, which turned out to be located almost immediately beside one of the train stations, Along Came Quilting. I spent a stupid amount of money here. Hey look – more text prints! Well, first up is the one non-text print in this batch – the red print in the top left is from L’s Modern Basics for Lecien fabrics. Such a great colour. The purple one is an unknown – no info on the selvedge. I don’t really love the blah blah part of it, but it’s not easy to find really purple purples with text on them, so there it is. And then the red text print is from Pat Sloan’s The Sweet Life for Moda Fabrics. My cold dead heart doesn’t like all the uplifting messages on this one either (I rather text that’s random or is largely unreadable or is in another language), but again: it’s a very red, red. Finally, maths. My selvedge is incomplete, but I can see enough to tell this is called Math Genius and it’s been made by Benartex. I let myself get sucked in by some super sweet Hello Darling by Bonnie & Camille. I’m not quite sure what it is about their fabrics that makes me buy them, because generally I dislike all things sweet girly pink and floral, but this is at least the third line of theirs that I’ve bought. I’d have bought the green strawberry print if this shop had had it, but they only had two bolts from the line so I guess sometimes you take what you can get. Linking up with the ever-fabulous Molli Sparkle’s Sunday Stash. And check back Wednesday. If I’m not too lazy, I’m hoping to update with a work-in-progress post (because I’m working on lots of things!) and it’ll be attached to a giveaway… it’s my birthday week (obviously I deserve a whole week – it’s one of those big, every five years, birthdays) and that means a giveaway for anyone who might still be thinking I might update again one day. Categories: Fabric Friday | Tags: Andover fabric, Bonnie & Camille, fabric, fabric stash, Moda fabrics, stash, sunday stash, text, text print fabric | Permalink. If you saw my post the other day about why I’m Fabric Fasting, then you may have also seen those ginormous lists of WIPs and wish-they-were-in-progress projects. I don’t have any delusions about finishing all of those before the end of 2014, but I’d really, really like it if I could knock at least a few off the list. And, ahem, maybe start fewer new projects for once. I don’t want to start with all the easy ones (ie. all the small projects :D), but I also want to be realistic about what I can finish in any given amount of time. So I think I’m going to try to set a few monthly goals, something realistic given the time I tend to devote to sewing and something a little bigger and a bit more pie in the sky. My Lovely Year of Finishes goals will always be the realistic ones, because they seem pretty focussed on the idea of having manageable goals, and I can get behind that! So January. For January, my ALYoF goal is the starred one – to finish my Sunshine cushion cover. It’s further along than this picture implies, but I’m still back-and-forthing on whether or not to pick out that embroidery and do it again in a darker thread. (Orange seems a good choice.) On the one hand, I love the stitching and think it came out beautifully and am loathe to pick out something that came out so good on the first go around. On the other hand, it nearly blends into that yellow and if it’s not readable, who cares how good it looks? For my other goals/hopes, the bee blocks are a given. I have to do them (because I don’t want to be a jerk who reneges on her promises) and in fact hope to get them done today. One is a very simple paper-pieced block with large amounts of negative space surrounding it, and the other is a fairly simple herringbone-style block. For the Catvent quilt, I’ve got two rows almost competely finished. I’m tossing around the idea of making only three (rather than 5) rows of faces and using some of my Mad About Patchwork giftcard to buy some of the Catnap fabrics whenever they arrive and piece in chunks of those in place of making all 25 blocks. I don’t know. I was enjoying piecing all those blocks and choosing all kinds of different scraps to go into it, but it’s not a project I’m super devoted to, it was just an entertaining diversion; so is it worth putting a lot of time into? I don’t know. It’ll be good for practising some quilting, though, once it’s all pieced together. So, if tl;dr… I’m linking up to A Lovely Year of Finishes with a goal of finishing the Sunshine cushion cover. Anything else will be gravy. Categories: A Lovely Year of Finishes, Fabric Fast/Finish It Up, UFOs and WIPs | Tags: a lovely year of finishes, a year of lovely finishes, alyof, alyof goal, Bonnie & Camille, cats, catvent quiltalong, confetti go lucky, confetti quilt, Elizabeth Hartman, V and Co, Vanessa Christensen, work-in-progress | Permalink. In the meantime, here’s some more of that fabric binge I referenced last weekend. So sorry Comma – I washed you out and made you look so much less attractive than you actually are! Well, try to imagine these in the citrusy palette! But now comes the proper binge. The Black Friday PinkCastle binge. In a way, this is a kind of wasteful purchase. Wasteful in the sense that it’s basically a scrap pack, but because it’s been curated and chopped down into sixteenths of a yard (which must, admittedly, have been time consuming), it wound up costing me $14/yard instead of Pink Castle’s more typical, say, $10-13/yard. But it’s 32 different 1/16 yards in jewel tones. And look at those luscious colours and lovely prints. Some of these I’d love to go back and buy entire yards of. (But I’m not going to.) The plan for this pack, and the whole reason I bought it, is to put it to use in the Gypsy Wife pattern that I showed last week. I want to make that quilt as scrappy as the pattern, but scrappy within a certain set of colour values, I suppose. Since I was there, I didn’t waste any time snapping up these Bike Path prints from Alison Glass’s Sunprints collection. Don’t forget to stop back tomorrow for Sew Mama Sew‘s Giveaway Day, wherein I’ll be giving away an entire Sunday Stash post worth of children’s fabrics. If you’re in love with canvas elephants or little dinosaurs or ladybugs… this is the place to be. Categories: Fabric Friday | Tags: acacia, Alison Glass, Bonnie & Camille, Comma, fabric, fabric stash, happy-go-lucky, sunday stash, Tula Pink, Zen Chic | Permalink. Yeah, I don’t know what to call this quilt, but the fabric is from the Happy Go Lucky line and the quilt pattern is called Confetti. The first five blocks are pretty much a variation on this: two joined hexies and one lonely one floating on an enormous, mostly empty block. I won’t show all five blocks. But they’re all pretty similar – one hexie in one quadrant and a set of hexies in the opposite quadrant. I tried to make sure none of the blocks had the exact same placement, so hopefully they’ll seem a bit like confetti tumbling around. I’m only just working on the next four blocks, and haven’t stitched down the hexies yet. I’m off-and-on quite nervous about that backing fabric, which is a Kaffe Fassett shot cotton (I think in Jade, though I forget the colour name for certain). It’s not a colour that really appears in the line at all, but somehow it just seems to work sometimes. And then sometimes I’ll look at it another way and be convinced that it can’t possibly come together. I’m sure it’ll be fine, though I can’t begin to imagine what colour thread I should use to quilt this. (The backing is going to be largely navy – the navy print with the multi-coloured pom-pom dandelion things. The binding I’m undecided on – I ordered two different fabrics to test against the shot cotton, one which dark grey on light grey and the other which is I think dark blue on light blue.) Maybe I’ll just use a variegated grey – I know I’ve got a new spool of that and it wouldn’t stand out too much in any case. Dunno. It’s going to be at least another week before the backing fabric arrives – I hope it’ll work, because it’s getting a bit difficult to find Happy Go Lucky fabric (in large quantities, that is), and I don’t really want to use the shot cotton as a quilt backing. Things to think about, anyway. Categories: Quilt Blocks, Quilts - Lap or Bed-sized, Work In Progress Wednesday | Tags: Bonnie & Camille, confetti quilt, happy-go-lucky, lap quilt, quilt blocks, v & co, work in progress wednesday, work-in-progress | Permalink. I don’t know if Cat actually wants this block, but she’s getting it anyway! If you want to make your own set of these two blocks, you can find the pattern here at Quiltville (and you can see how it looks when you multiply the block across a quilt). Man was this not a happy block to make. There are parts of this block I stitched and then picked out, twice, before it finally looked good. And it does look so lovely, but there are 4 layers of fabric in the centre (6 where the lip of the cathedral window is sewn over), so you can imagine just how thick that central patch is. (Especially when you start thinking about how many layers are contained in the seams in the centre!) I like how this looks, but can’t quite imagine it as a block in a quilt. Maybe the recipient will cut out all those extra layers from the background… I don’t know. I just don’t know WTF I was thinking when I chose that fluorescent green OR that mint green. I rather think anything would have been a better option than those two colours. My only defence is that the lighting is very bad in my sewing room and if it’s dark outside, the overhead light makes it hard to see what’s what. Anyway, it’s going into a quilt with a mishmash of colours, so I’m hoping it’ll just sort of… blend. In any case, those things are finished now, so the work-in-progress part of this post is the hexie quilt I’m working on. I’m using two honeycomb packs of Bonnie & Camille’s Happy Go Lucky line, and I finally, finally sorted out the issue of how to deal with the hexies. I didn’t want to have to trace a bunch of hexagons onto the roll of freezer paper I’ve got, but when I tried buying papers from… that company that makes pretty much all the English Paper Piecing shapes you’ll stumble over on the Internet, the ones I was sure would fit were actually too small. So I bought some freezer paper sheets, ones that are cut to printer paper size, and then I worked out how to get two of the shapes to fit onto a single sheet of paper. And then I got to work centring and pressing on all those freezer paper hexagons. I think they’re just a hair too large (I should have trimmed off all the black outline of the shape, I think, rather than leaving it on), so before I reuse those papers, I’m going to trim off those little extra bits. There’s a little less than a quarter-inch of fabric in my seam allowances, and I’d hate for any of these to blow out when I wash the finished quilt. And here’s a shot part way through folding over and pressing down all the edges. Bit of a dull job that, but I did get finished five sets of three, which is exactly what I need for the first five blocks of V And Co’s Confetti quilt. Now that I’ve got 5 blocks worth of hexagons dealt with, the next bit will be cutting out the 24.5-inch square blocks that I’ll those hexagons will get stitched to. I haven’t used it before, but I’m planning to sew them down using water soluble thread so that I can quilt it down properly later on without having existing stitching interfering with anything. Anyway, I was typing about home inspections a few moments ago (what? what?! what!?! ), so I think that means I’m too tired to be lucid any longer tonight! Time for bed. 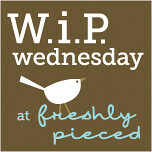 Categories: Work In Progress Wednesday | Tags: Bonnie & Camille, hexagon, honey comb, livejournal exchange, Moda fabrics, simply solids bee, swaps, WIP Wednesday, work in progress wednesday, work-in-progress | Permalink. I spent an embarrassingly long time sitting and staring at that one hexie yesterday trying to decide which way to go with it. The Paper Pieces package recommends sewing through the paper, but I want to use them multiple times and so I can’t help thinking it MUST be better for the paper not to sew through. The package does say you can keep reusing them anyway, but don’t they get all damaged in the corners where the stitches go? I don’t know. I’ve been planning today to watch a few videos on YouTube to see if I can decide which looks a more likely route for me. Not sold on the denim yarn-dyed Essex Linen. I like it, a lot, but it feels too pale compared to the darker blue, maybe? (Special thanks to Michelle for her contribution to these fabrics being in my stash! :D) I thought from photos online that maybe it would be a darker blue than it is. I think a bag looks top-heavy if you put the darker fabric on top, and I could switch it so that the print fabric is on the bottom, but honestly I don’t want that much of the print on display. The bag on the pattern cover has a darker top band, but I think that large print on the bottom (with the smaller print up top) counter-acts the top-heaviness. I’ll have to think about it. I might have some Kona Nightfall fabric that would probably work (maybe?) and would definitely be darker. I don’t want to have to buy more fabric, in any case. 3. Leftover bits from something I’ve been working on. 4. The solids Churn Dash. Just need a few more… Well, I need one more row’s worth, plus I’m waiting for 2 that will be sent to me. Love how this is coming together. 5. Some of my problem spots with the FMQ on the Star Surround project. If you have suggestions or advice for avoiding, please let me know! There’s lot of little things to nit pick with this one, which I will nit-pick in other photos instead, what I took this photo for was the kind of jerkiness of it. I didn’t get a smooth loop at all on that top one, which was just me needing to stop and get my hands in a better position (but just pushing through anyway). What really bothers me is the stitches just before it goes from a straight(ish) downward line into the loop – you can see a spot where I went from vertical almost immediately to horizontal, and although I mentioned this was a spot where I’d needed to reposition my hands, I ALSO had that same issue in places (sometimes) where I did come to a complete stop, and then started again. Sometimes I could get a smooth restart and then other times I’d go off in a completely different direction than I really “should” have. I KNOW that it’s not going to show much in the grand scheme of things (which is why I didn’t pick out any of my stitches, except where there were thread breaks and the one time I had a toe catcher), but I’d still rather learn to prevent it. Okay. You can see a bit of this in most of my photos, but the bobbin thread is even more visible in this photo because the darker part of the variegated thread is on the bobbin thread here, with a very pale part on top. I always thought this was a tension issue, but my machine is set at almost the highest tension available. I didn’t adjust it to the higher setting because it didn’t do this all the time I was FMQing, so I wondered if something else was at work? I don’t know. If any of you do much FMQing and have thoughts or suggestions, let me know! I know it’s not easy to diagnose when you can’t see what I do when I quilt, but I figured someone might have thoughts. Categories: Fabric Friday, Free Motion Quilting, Random Stuff, UFOs and WIPs | Tags: Amy Butler, birdie sling, Bonnie & Camille, Essex Linen, fmq, free motion quilting, hexagon, Kona cotton, laura gunn, liberty of london, liberty tana lawn, linen, livejournal exchange, Moda fabrics, poppy, quilting, quilting bee, scraps, shot cotton, simply solids bee, solid fabric, tote bag, work-in-progress | Permalink. There’s a lot not visible in this photo – all the swirls around the sides to represent spinning through the time vortex, I guess? – so I’ve really still got a long way to go. I’m hoping to be finished this weekend, but I’ll be honest: I’ll be happy if I’m done by next Wednesday! If you want to see a finished version now, though, and get the pattern, it’s available right here at Fandom in Stitches. Like I said, I went out with a friend yesterday rather than coming home to stitch, but it was such a mixed evening I think I almost would have rather been home to stitch! We went to a movie, The Heat, which was only so-so at best (a lot of the jokes just don’t quite hit and it’s too long for what it is, they should have tightened it up a lot), and then we went out for dinner where my friend didn’t enjoy any part of her meal and although mine was fine, it was also not really anything special at all. Just wasn’t our day, I guess! Anyway, by the time I got home, I was more interested in sleeping than staying up to stitch or write up a post about not being finished. I should have been stitching today, but instead I got sucked into a vortex of trying out a Bonnie & Camille “Happy Go-Lucky” honeycomb with half (well, a couple… I’ve got piles more, just in really inappropriate colours) the solids/near solids I own. Here’s far too many of them, with my thoughts, and request for your own. The pattern I’ve decided to use is the Confetti quilt by V & Co., which has a baby size and also a… twin? size that uses two honeycombs. I haven’t seen any pictures of the quilt top that show it in the larger size, but there are several photos at V & Co.’s site that’ll give you a general idea of what the quilt will look like, at any rate. There are very large open areas in the quilt, so that background is going to be much more visible than it is in any of my photos (and the light was kind of weird, so you’ll get a lot of sun at the top of each photo and much less at the bottom – what I like about that is that it gives you an idea of what the fabrics will look like in different lights, but it does wash it out some up top). First the Kona cotton in Black, which I like for how it lets the colours/fabrics pop, but which I think is just all wrong regardless. It’s just too dark for such a sunny collection of fabrics, even if it does work in a technical way. And beside it a Kona white, which is fine but… also just all wrong. It somehow emphasizes the non-whiteness of the white in the prints and even though white suits the prettiness and delicacy of some of the prints, it sort of feels fussy to me to have florals paired with a pristine white like that. And then these two are two Moda Bella cottons, one is Snow and the other is Natural, but I don’t have a colour card for Bella, so I can’t figure out which is which. (And in photos, they’re nearly indistinguishable.) The whites in the prints look more pristine here, less dingy I guess, than in the photo on the pure white, but the’re just so BORING. I thought I would wind up liking it best on grey, but I tried two greys and don’t really like either of them. Kona Ash (left) is a nice grey, but it while it doesn’t hurt the prints in any way, it also doesn’t do anything to elevate them, if that makes sense. The Medium Grey isn’t too bad – like a black, it gives the fabric something to pop itself up from. But I don’t know.. it’s only just okay. I didn’t have any darker greys to try with – I thought I had more Kona Charcoal, but couldn’t seem to find it. So okay, Essex Linen blends. Nothing I have is labelled so I’m often uncertain, but I think this is the Yarn Dyed Flax, it kind of looks like a grey and white cross-weave, in a way. The one on the right is maybe Essex linen in Natural – it kind of has an oatmealy colour. I like them both, really, because they’ve got a bit of interest even though they’re near-solids, but they are a little bit boring still. And I wonder if it would be heavy having a quilt top made with 6 yards of linen? Maybe that would be nice, I don’t know. So something more interesting, but also maybe more scary? The Kona Sunflower? (Or is it Daffodil? It seems to match Sunflower on my colour chart, but Daffodil sounds more like something I’d have actually bought. I actually like this one – it’s a great match for the print – but it’s scary to think of 72×96″ of yellow with a scattering of other colours. I think it would be a little too intense in a not very good way. So finally that leave me with two unknown shot cottons. I’m pretty certain I bought both of these from Mad About Patchwork, but I can’t figure out what either of them are. I’m pretty certain the one on the left is from the Kaffe Fassett collection. It’s a kind of turquoise colour but it looks like it’s made up with two different turquoises, one darker and the other lighter. I actually kind of love the way this one looks, but I don’t know why. I feel like it shouldn’t work, because it’s turquoise rather than something more bluish-blue. I quite like the one on the right too, but haven’t got any idea what fabric this actually is – it’s made of a blue and a green cross-weave, which is more visible than in the one on the left. It’s a bit quieter of an option, but probably in a good way, as it wouldn’t overwhelm the quilt like I think the turquoise one would (and like the deep blue up above would). I don’t know, I’m pretty torn! I’d like to make this quilt for my mom for Christmas, if I can (though hexagons? Scary! ), so I need to make a decision so that I can get started, but I’m not really sure what to do. I lean towards either the Kona Deep Blue or either of the two shot cottons, but I don’t know how to find out what colour I’ve got (without buying a colour card, which is.. not cheap). Any suggestions? Other colours you think I should try? Categories: Embroidery & Needlework, UFOs and WIPs | Tags: Bonnie & Camille, crossweave fabric, DMC floss, doctor who, doctor who stitch-along, dwsal, embroidery, embroidery floss, Essex Linen, fabric, fandom, fandom in stitches, happy-go-lucky, Kona cotton, Moda Bella cotton, shot cotton, stitching, Westminster Fabrics | Permalink. My first purchase was 4.5 yards of fabric from a Canadian shop on Etsy, Kloth Shoppe. The text print up top is Merci Beaucoup from Stof and the one on the bottom is from the Bon Appetit collection for Michael Miller. The green and blue is from Amy Butler’s Lark line. I wish I’d bought more of that one because I really like it, it’s a lot less busy than a lot of Amy Butler’s prints these days. What I was really needing was fabric for a baby quilt for an old friend of mine; she’s having her first baby in fall/winter and I wanted to make something for her even though we haven’t been in contact in years. (Her mom and my mom are friends, and occasionally my mom sees this old friend of mine, so I still hear bits of news. When I was living in Saskatoon, the friend was in Regina, and then I moved out to Calgary, and now she’s living in Saskatoon. We haven’t been in contact since we lived in the same city, though, so it’s been probably 6 or 8 years since we’ve really spoken.) Anyway, back in the day she wasn’t really into anything very cutesy, especially for boys, so I wanted to make something that has a slightly masculine colour-scheme, but wouldn’t be particularly cute about it. No animal prints, no little boy robots or animal prints or whatever. So the thought was to make something using only striped fabrics, using a red, navy, light blue, and green colour scheme. (Yes, please do scroll back up and see how well I stuck to that thought.) I figured I’d make a double hourglass block with either white or a light grey as the solid. Two of my fabrics are flannel and the rest aren’t. It’s not that HT doesn’t say what type of fabric it is, I just wasn’t paying attention. (Did I say I was stress shopping? I was. I wasn’t paying attention to ANYTHING as closely as I should have been.) Fortunately the chevron print was meant for the backing material, and I’m definitely okay with flannel as a quilt back. It can shrink A LOT though, so I usually buy extra just in case, but I didn’t. Which I guess means it’s okay that the dot fabric is flannel too because if it does shrink too much, I can still piece the back a bit and keep it up to size. Still, that’s one fewer fabric for the front of the quilt (because I’m not going to mix flannel and cotton on the top.) The Chevron fabric is Medium Chevron in Boy for Riley Blake, and I think the dot is Circle Dot in Medium Blue by Alpine Fabrics. And hey, if I’m letting cars through, why not ships. And ships lead to a text-in-rope print and then dots. And if I was breaking all my rules, why not a cute squirrel print anyway? It fit the colour scheme, right? And that tree fabric is kind of stripey and it’s just awesome, so why not? Well, throw away the ships because they’re too tall for the hourglass pattern! And once all this fabric arrived… I don’t really want to use the ones with the orange in them or the grey star because they’ve got that sort of dingy colour scheme that I often find (and don’t really love) in Japanese fabrics and the squirrel and tree are too far off message. While all this shopping was going on and I was still looking around on Etsy, I found a shop that sells Sewline Supplies. I’ve previously bought all my Sewline stuff from a Canadian Shop Which Shall Not Be Named (because of a bad experience earlier this year while trying to buy some refills for my glue pen, I don’t think anything malicious was going on, but certainly a big bout of laziness/not having enough staff maybe and some misfortune getting their products across the border, but it was still a piss-off for me) but haven’t found a lot of shops that sell it, and so when I did find Our Epoch, I thought I’d better buy enough to make the shipping worth the while. So the necessary stuff was the Sewline Glue Pen refills (I only bought one package, but they accidentally sent me two, which they’ve told me just to keep – I was willing to mail it back because I don’t use SO much glue that I need four refills right now) and the Ceramic pencil leads, in white and pink. (I’ve been using white and green, but I don’t think they had green, so I figured I’d try out the pink for a while.) The Magic Bobbin Washers are always recommended by Leah Day of The Free Motion Quilting Project, so I’ll try them out. The lime green ric-rack is just because I liked the colour, and then two honeycombs of Happy Go Lucky by Bonnie & Camille, who somehow manage to break past my general dislike of florals. I always love how their collections look when they’re all together, they’ve got a great colour sensibility. The Grip Disks are just for a couple of my cutting rulers that don’t have very good grip and slid all over the place. (The absolute worst is a Dresden plate ruler I’ve got. I’ve had it for years and it’s so slippery it’s a wonder I’ve never chopped off a finger tip while trying to cut with it. Then again, I’ve never made a Dresden plate because every time I’ve tried cutting the fabric, it’s slipped all over the place and I’ve not gotten appropriately sized units.) And last up are the oval quilt clips, which just seemed like a neat idea: when you’re quilting a large quilt in a home machine, you can roll up the excess quilt and hold it together in a roll with those clamps. Seemed like it might be worth a try. Anyway, that’s it for my ridiculous shopping extravaganza. Now I just need to reevaluate all the fabric choices for that baby quilt in the making. (And why couldn’t she have a girl? I’ve got a spare girly quilt top that just needs to be quilted!) And then get to work. Categories: Accessories & Notions, Fabric Friday | Tags: Amy Butler, Backyard Baby, Bonnie & Camille, David Walker, fabric, FreeSpirit, happy-go-lucky, hexagon, Lark, Michael Miller, Moda fabrics, notions, Out to Sea, Patti Sloniger, quilting, ric-rack, Riley Blake, Rowan, Sarah Jane, sewline, Stof, thread, Westminster Fabrics | Permalink. So I slept last night under the quilt I made my mom last year and it was a pretty great quilt to sleep under - a bit heavy but not stiff like over-quilted quilts can get. But I feel like I need to give my mom a talk about her bad behaviour - it's on the bed in the unused spare room, its covered in glitter!, and there's a big stripe of dust on it (because she had it covered in boxes for 4 months and dust settled in the space between them). For shame, mother.